In my system, the Orion ASP is powered by a +/-15 volt 1 amp Acopian LD15-100 power supply . This power supply has connections for remote sensing which for the past six years have been hooked up as local sensing of the output terminal voltages. At a friend’s suggestion, I wired the sensing to the power entry of the ASP some four feet closer to the circuit boards and was surprised and pleased with the increased clarity. I could only imagine the benefit of bringing better regulation right to the ASP boards. So the hunt began for an available regulator implementation. Space is a big factor since my ASP boards are crammed into a case along with subwoofer crossover and EQ boards and my passive buffered linestage. I reviewed all the boards that I could find on the web, and the boards I bought from Ed Dell’s outfit a few years ago. Every board was too large, some had features that I didn’t want. This led me to design a new circuit board. 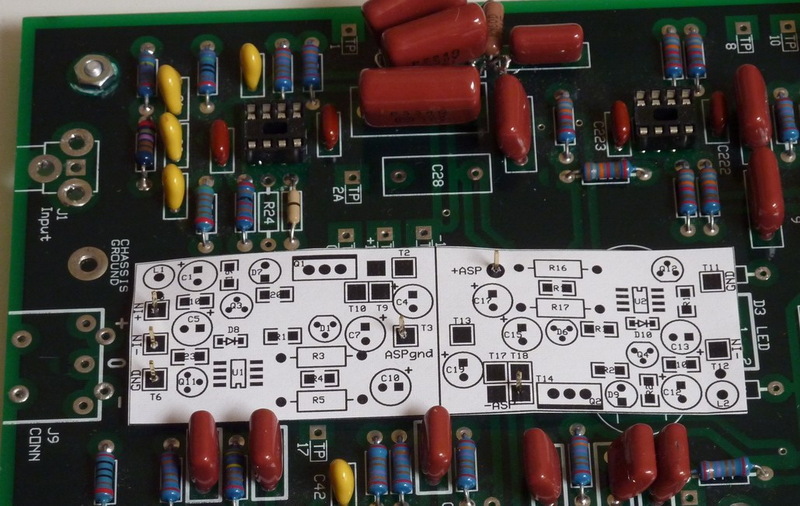 I was familiar with the PCB services and board sizes from expresspcb.com because I used them for the first circuit board I designed, the AN1651/Curcio phono preamp. As luck would have it, two dual regulators fit on the standard board size in their prototype packages. Each regulator would be the ideal size to fit on the ASP board: 1.2″ x 3.8″. This is roughly the space occupied by the DLC supply filter on the ASP. The regulator daughterboard could be attached to the ASP with pins and sockets. The raw input supply would enter the regulator at one end and the outputs and ground would go from the center of the regulator back to the ASP supply rails. When the DC filter components are removed from the ASP, the raw supply is fed from the ASP power inputs to the regulator, then the regulated supply goes back to the ASP. A quick PCB design using mostly surface mount devices was printed out and checked against the board. The following photo shows the early proof of concept and mockup for the board. Note the gold pins piercing the paper mockup. 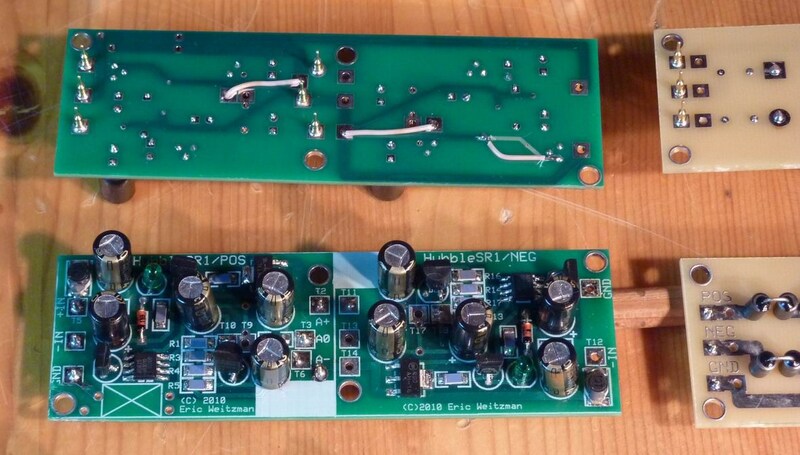 Siegfried’s w-ASP board (woofer ASP) has the same hole pattern and DC filter. The Hubble should fit on these too. Provision was made for one capacitor on the w-ASP that intrudes into the Hubble’s footprint. The circuit I implemented is based on the version in the 2000 Jung article with the opamp power bootstrapped off the regulated voltage. The pre-regulator was omitted to save space and two other reasons. The raw supply for the regulator is the output from another regulated supply and the pre-regulator would have little advantage. The Jung circuit is designed to accept a rectified and filtered (but not regulated) raw supply. An advantage of the pre-regulator is that it allows for minimum dropout across the pass transistor. This reduces the pass transistor’s dissipation. The pre-regulator also keeps the pass transistor dissipation nearly constant, reducing dynamic changes. I planned on setting up the boards for minimum dropout anyways so these benefits weren’t needed. The improvements to the 2000 circuit were limited by Jung’s goal of making them compatible with the existing boards being sold by Ed Dell. Further improvements were found in his later short articles and other implementation. One of those later articles shows an LCR filter on the raw input to block any RF interference piggybacking on the input power lines. After an extensive search, I found a tiny SMD choke to use as part of this filter. Its DCR is higher than ideal at 0.5 ohms, but causes negligeable voltage drop at the target current rating. Another article and the other implementations replace R23 with a transistor to sink the excess current from the current source. In the previous designs, the error opamp handled the current. The transistor allows the current source to run at a higher current without heating the error opamp. This setup is supposed to produce better dynamic behavior. 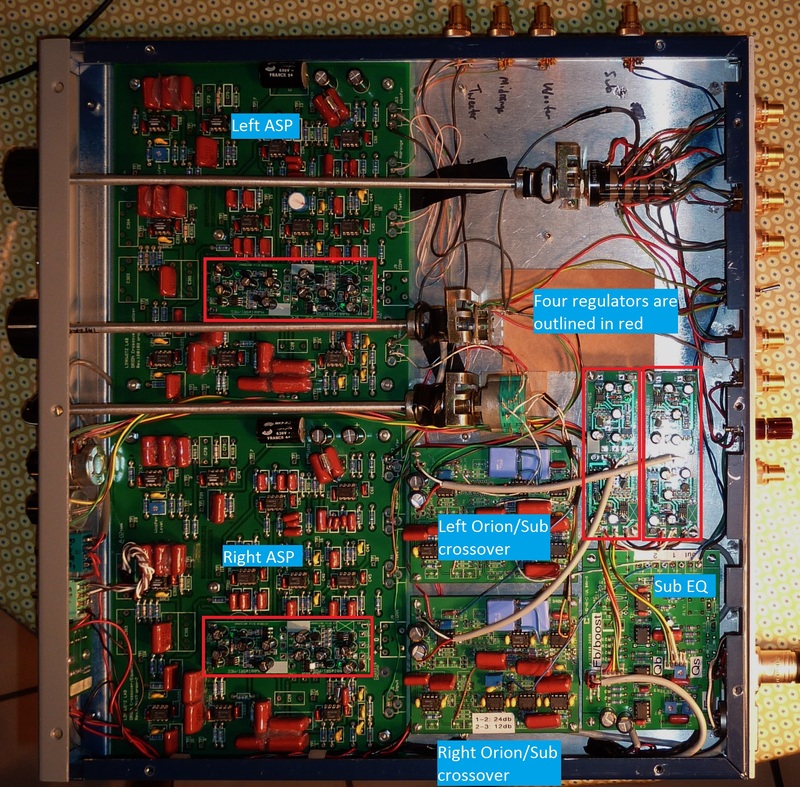 The opamp input protection diodes were omitted, as well as the optional RF gain reducing networks shown in the 2000 article for stabilizing the AD797 opamp. A 0.2 ohm resistor is added in series with the output capacitor C4. This capacitor should not be high quality (ie, very low ESR) or else there will be an effective short at high frequencies. The resistor is a controlled way to ensure high ESR. Parts selection was dictated to a large extent by the small board size and lower current requirements. Surface mount devices were chosen when they were smaller than through-hole types. Different transistors and opamps were used in the reviewed designs, and small footprint and/or surface mount types were selected. Panasonic has several electrolytic capacitor lines that replace the HQF caps in the original articles: FM for through-hole and FP for SMD. The 120uF caps were replaced by 100uF caps due to availability. It turns out that both FM and FP have 6.3mm diameters, but the SMD FP occupies more space due to the square footprint and the extra room needed beside the cap to hand-solder the SMD leads to the board. But the FP caps are shorter and would be a better choice where the board needs to be under 10mm high. It was difficult to determine the dropout voltage from the articles. A precise statement of the dropout voltage couldn’t be found in the articles and worse, each approximate value mentioned differed from the others. Running simulations turned out to be misleading: my first simulation approach gave wrong values though the regulators were regulating. The second simulation approach produced useful results. 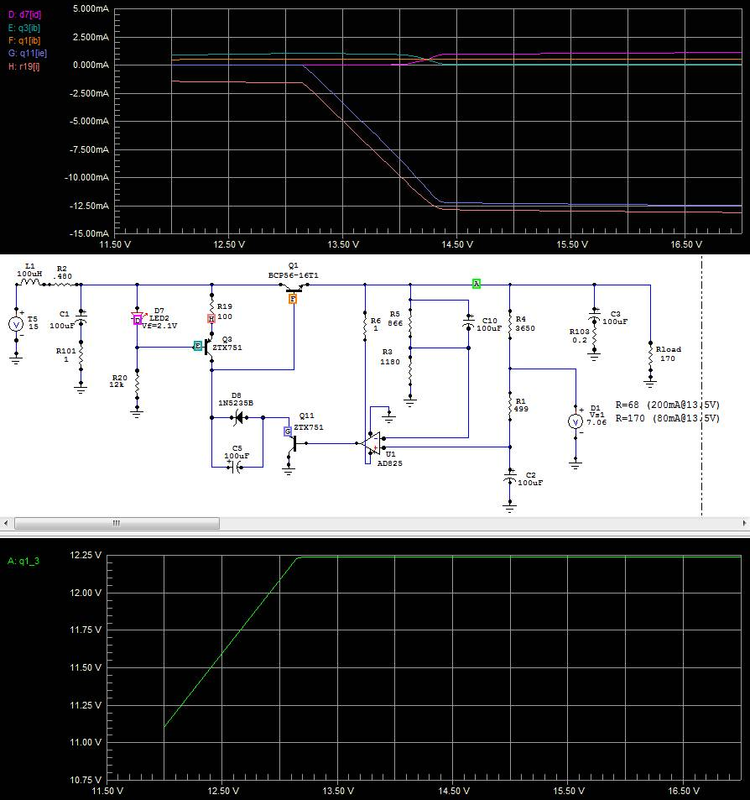 Here are two graphs showing the behavior of the current source as the unregulated input voltage is swept from 12v to 17v. The load is pretty light in this model: the details change as the load goes up, but the general pattern remains the same. The second graph shows the regulated output voltage on the y axis as the input voltage is swept (x axis). It stabilizes at 12.25v when the input voltage is 12.7v. It appears that the dropout is around 0.5v. The first graph shows the currents as the input voltage is swept. The orange curve is the pass transistor base current. It’s a constant 0.5mA regardless of input voltage. The cyan curve is the current through the current source’s bias LED. It’s zero until the input voltage reaches 14v, then increases to 1mA at 14.4v. Meanwhile, the base current of the current source transistor is 1mA, then it drops to about 80µA when the current source is working properly at 14.4v input. These two currents swap values through this transition. Meanwhile, at any input voltage, the LED current setting resistor (R20) gets a constant 1mA, whether coming from the LED or transistor base. The current through the current source is the salmon colored trace, and the current sunk by the error amp/transistor (periwinkle trace) parallels it pretty well, leaving some current for R20 (when the input voltage is too low), some for the error amp, and some for the pass transistor base. Only above 14.4v (input) is the full current flowing through the current source, the LED current at the correct value, and the full excess current from the CCS flowing through the error amp circuit. This voltage (14.4v) defines the dropout, which is 2.2v at this load. I ran some simulations where various disturbances were added to the load. Load rejection ranged from 140db with a 1v AC 10kHz sinewave in series with the load to 80db with a 5v 10kz square wave. The PCB is four layers. The internal power plane is blank. The internal ground plane sits below the control circuitry, circumnavigated by the main power traces. There are two star grounds: one for the returns of the raw input supply, and one for the sensitive returns of the control circuitry. The latter can be used for remote ground sensing. The board can be split in the middle and used for independent single positive and negative regulators. The layout was constrained somewhat by the placement of holes for the pins that would connect the raw inputs and regulated outputs to the ASP. Round pins and machined collet-type sockets were used. The pins are visible in these photos. Another simple board was made that’s pin-compatible with the ASP and the regulator. It can be used as a test jig or it can be configured to hold the DC filter that is specified for the ASP. When configured this way, A/B comparisons can be made between the original filter and the regulator. When hooked up to the sub crossover boards for remote sensing using 6″ leads, the regulator oscillates at around 1.4MHz. Attempts to stabilize it with an RC filter in the sense loop haven’t worked. I think there might be ground loop issues in my configuration, or the remote sense pad locations on the PCB may be the problem. 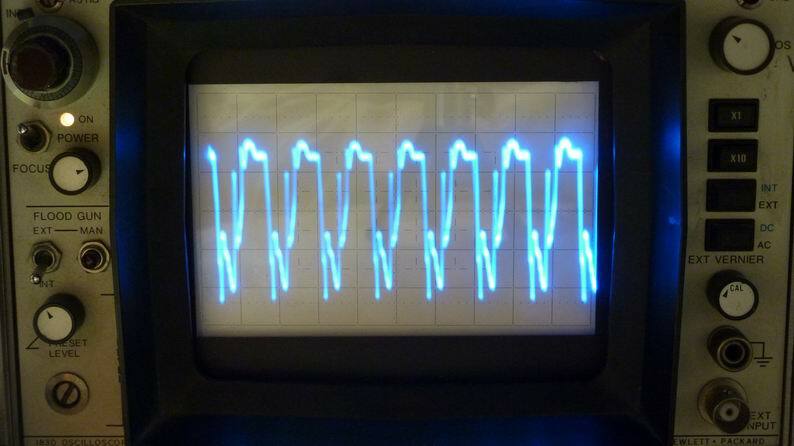 Oscillation is visible on my 50MHz HP 180A oscilloscope. There is no oscillation when the regulator is installed on the Orion ASP. This is because local sensing is used instead of remote sensing. One board did oscillate in the ASP, but not in the test rig. This stopped once the dropout voltage issue was settled and the current source was running properly. Each step yielded more detail in the music. The first and last steps produced big benefits. It is very revealing (or not…) to put back the Elpac and the original DLC filter. I have taken a quick look at your regulator pcb. I think your main mistake is your grounding scheme. The grounding is extremely important. Star ground is a good thing but you have too long traces. 1 nH per mm and you have many millimeters. Having “L” in your ground is not a good thing when you have a 40 MHz circuit. Sense connections usually needs local decoupling in order to get stability. You can check how I have down. You can download one file per day with paying anything. Good work otherwise and you have made a good presentation. There are several very long wide traces that you see on the back of the board that are on-board extensions of the external unregulated wiring to the actual terminals of the regulators. The board is designed to plug into the Orion ASP and the unregulated power is at a fixed location. The narrower ground traces on the back of the board are for star grounding to the unregulated star ground points T6 (POS) and T11 (NEG). I agree that these traces are long (about an inch) and shouldn’t be shared, but they’re a bit shorter than the Didden board (different connections too). This is a very tiny board. As T6 gets closer to the things connected to it, it gets farther from T3 which must stay where it is to connect to the Orion ASP. On your JSR02 board, T6 and T3 (J2 and J4) are at opposite sides of the board, about 1.5″ apart. Didden has them right beside each other. I don’t know the right tradeoff: short internal grounding or short unreg-reg ground connection? There are holes for a 5mm 0.1uF decoupling cap on the board if needed to stabilize the remote sensing. I omitted the cap outline from the silkscreen. You can see an extra hole near the T9 and T13 terminals. The other cap hole is closer to the pass transistor. Why did you parallel this cap with a 220R resistor in your SSR02 circuit, and why did you duplicate this in the ground sense line? Another PCB is in the works with better compromises and some fixes. It uses SMD electrolytics for more routing space on the bottom, fewer interruptions to the ground plane, and better access to the connectors. I have the 220 ohms to the sense inputs as a protection. They must be connected somewhere under all circumstances. The cap is for decoupling since the sense function doesn’t work for longer distances. Notice that my pcb seems to be the best in the world (according to measurements), even better than the original and I think the main reason is the 4-layer board and the extremely tight grounding and total separation of the signal ground from the power ground. Nice job on the blog! Any chance you will make your piggyback regulator board available for sale to Orion owners. I have been planning to build an RJM X-Reg supply for my Orion ASP…I recently built the Phonoclone that uses it and have been very pleased with the results…but your solution looks more elegant and customized for the Orion ASP application. Excellent work. I have a question. The superreg does not expect much more capacitance at its output. 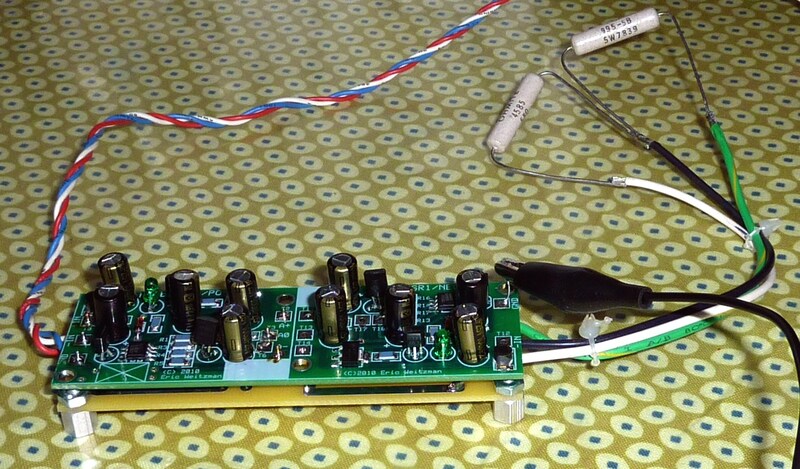 The Orion boards must have a number 100uF electrolytic capacitors and some 0.1uF film capacitors for local bypass. How well does your regulator cope with those? Many thanks, Regards, Bill.